Popular as an alternative sweetener that is calorie free, Stevia has been used for 100s of years and is now finding a place in commercial food production. However the health benefits of ‘growing your own’ stevia are said to be based around the natural health benefits that are removed by commercial processing. 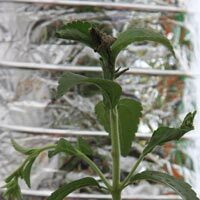 Stevia plants are best known for Stevia rebaudiana or ‘ Sugar Plant’. These plants used as ‘sugar plants’, have been used as ‘sweeteners’ for many years in South America and is very popular in Japan. The ‘Sugar Plant’ does best in frost free warm areas and prefers a humus rich moist but well drained soil. It will reach around 1m and in commercial growing the whole plant is harvested. In cooler areas, if left it will die right back in winter and hopefully re grow in spring. You can grow plants in containers, use a good sized pot as plants can reach .7m in height. Usually 4 – 5 plants will supply leaves for 6 months, depending on consumption. Seeds can be sown directly in warmer climates, or started indoors in cooler climates in late winter to early spring. Plants can be grown from seeds or more usually from tube stock or small plants available by mail order as germination of seeds is a little sporadic. It should also be noted that many plants are grown from cuttings of improved varieties and forms.